Conceptualised and hand-crafted by designer Chinanshu Sharma, the Parishaa jewellery line features delicate and intricate pieces made for the modern woman, echoing her taste in everything unique. Setting standards for style, design, detailing, quality and elegance, each Paarisha piece is one-of-a-kind. Unusual and vibrant colours combined with stone and metal embellishments are the basis for these designs, crafted with techniques that are age-old yet contemporary. Walk into the studio to experience the process of handcrafted jewelry being made and a wide range of collections to suit your style. You can even get a unique statement necklaces designed for yourself. 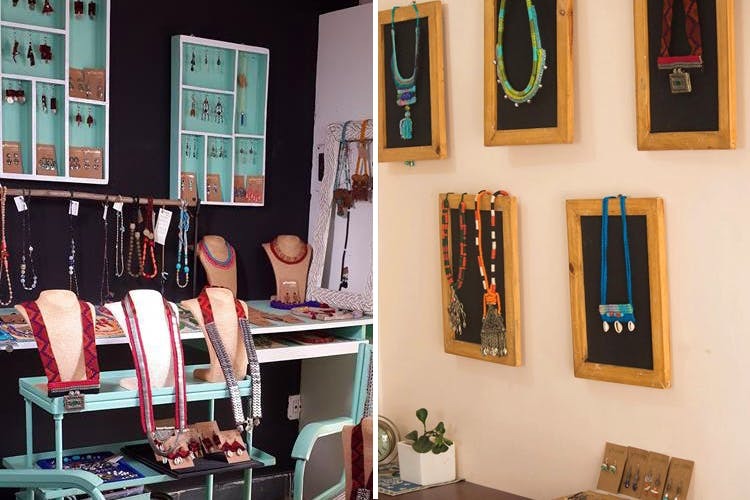 And don’t think that it’s conventional, from fabric necklaces to chic denim pieces and semi-precious stone bracelets, there is a range of options available. I love their silver oxidized collection, denim-patched light accessories and earrings with contemporary designs make for easy day-to-day wear. For a customised option do take a look at their range online to get an idea of the kind of work they do, before the appointment.